The Caribbean is known far and wide as one of the prettiest places on Earth. The waters are warm, the sand is soft, and the resorts are luxurious. Vacations in the Caribbean are highly desirable, with many people dreaming of someday spending a couple of weeks soaking in the sun and swimming among the tropical fish and vibrant marine life of the Caribbean Sea. It’s a dream destination, offering all kinds of exciting activities from snorkeling to surfing and so much more. If you’re planning a Caribbean vacation, you have a lot of destinations to decide between. There’s a long list of beautiful Caribbean islands, with the Dominican Republic being a prime example. This country is located on the relatively large island of Hispaniola in the Greater Antilles part of the Caribbean. It's the second biggest Caribbean nation in terms of physical size and the third largest in terms of population. It’s also the most-visited nation in the whole Caribbean region, beloved by legions of tourists from all over the globe. With a very long coastline stretching out around the norther, east, and southern sides of the country, the Dominican Republic is replete with magical beaches to take your breath away. Each beach has its own advantages and features, with some offering lots of amenities and activities, while others are purer and more untouched by the country’s thriving tourism industry. Read on for some overviews and details on the very best beaches of the Dominican Republic. Located in Punta Cana, which is one of the most visited areas of the Dominican Republic, Bavaro Beach truly looks like a little piece of paradise. The sand is whiter than any sand you've ever seen before and the waters shimmer and sparkle beneath the beating sun. Simply standing and admiring this beach can take your breath away, and it's even better when you step foot out onto it and feel that soft, silky smooth sand beneath your toes and the gentle warmth of the waves. 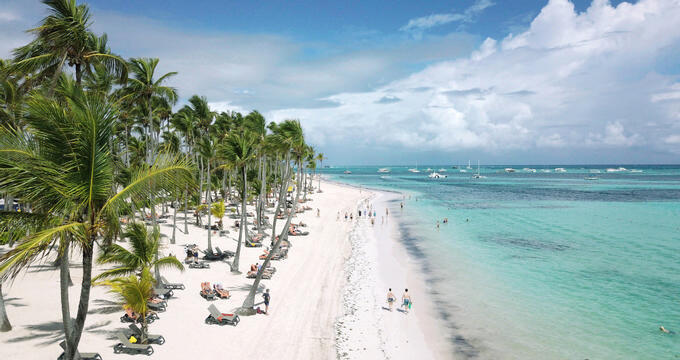 The waters at Bavaro Beach are very calm, providing the perfect conditions for swimming or simply strolling along the shore, and the beach stretches out for several miles, lined with lots of luxury resorts. Located on the Amber Coast and boasting some stunning sand and marvelous views of the surrounding Dominican Republic landscapes, Playa Dorada is the main beach of the Puerto Plata resort area. The views of the mountains in the distance never get old at this extraordinary beach, which is exceptionally long and never too crowded, with more than enough room for everyone to be happy. Another nice aspect of this beach is that even though there are several hotels and resort buildings along the way, they're all relatively small so as not to spoil the skyline or cast too much shade onto the sand. Lots of good quality restaurants are found near Playa Dorada too. Here's one for the families. Not far outside the Dominican Republic's capital city of Santo Domingo, Boca Chica Beach offers some very calm and tranquil waters. The nearby coral reef, which is formed in a curved shape, actually helps to protect the beach from the rougher waves further out to sea, creating a peaceful little spot for beach-goers of all ages to enjoy. The waters here are just right for swimming and it's not uncommon to see families and groups of friends engaging in games of beach volleyball and other fun activities on the sand too. Due to its ideal water conditions, Boca Chica Beach can get quite busy around the holidays or at weekends, but if you head out there in the middle of the week, you'll find it to be way less crowded. Unlike some of the more touristic beaches around the Dominican Republic, Playa Rincon is relatively untouched. It's one of the purest and most pristine beach locations in this Caribbean nation, with lots of welcoming shade provided by the long line of tall palms. This beach is found on the Samana Peninsula and is connected to the nearby town of Las Galeras, with boat rides going back and forth from the town to the beach each day. You can reach this beach by car as well, but the journey can get a little bumpy as the area is relatively undeveloped. All-in-all, if you're looking for one of the most peaceful beaches in the Dominican Republic, this is the best one to choose. Perfect for swimming, sunbathing, and surfing, the quiet and calm Playa Grande is a far cry from the touristic resort areas like Puerto Planta or Punta Cana. This beautiful beach is quite simply one of the island's little-known treasures, providing awe-inspiring views and golden sands. Some traditional concessions can be found nearby offering tasty snacks and drinks, and various private day trips can be organized to this beach from some of the larger cities in the area. The waves here can reach some impressive heights, so if you're looking to do some surfing in the Dominican Republic, Playa Grande should be on your list of places to visit.